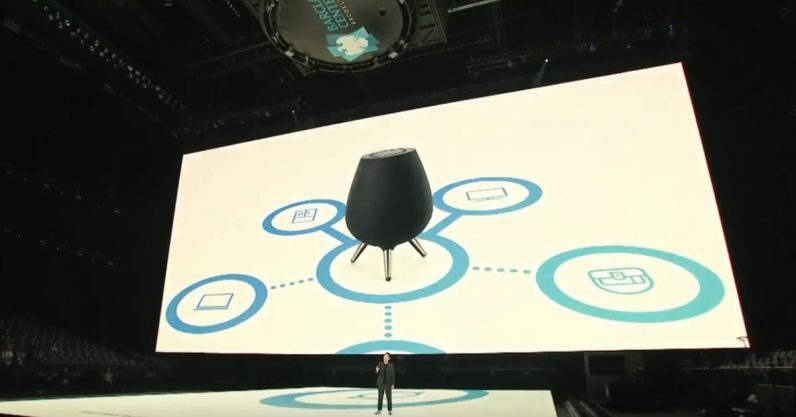 Samsung today revealed the final form of its oft-rumored Bixby-powered smart speaker, the Galaxy Home, at its Unpacked event. This nifty, tri-legged device takes its place on the market alongside the Apple HomePod, the Google Home, and the Amazon Echo. The Galaxy Home has eight built-in microphones and a touch display on the top. As you might imagine, you can use it to control other smart devices in the home, though the company is remaining buttoned up about the device’s full capabilities until the Samsung Developer Conference. Naturally, the company touted the Galaxy Home’s musical capabilities. According to Ji Soo Yi, Samsung‘s VP of AI Strategy, you can direct Bixby to “steer sound,” which will compel it to direct music at you, wherever you are in the room. Daniel Ek, CEO of Spotify, also unveiled a partnership between the Samsung and the streaming giant. A fruit of this partnership is a feature where your music “follows” you, playing from whatever smart device you’re closest to — and that includes the Galaxy Home. Personally, while I’ve never used Bixby, I’d go for the Galaxy Home just for the look. This little pot-bellied thing is a touch more aesthetically pleasing, in my opinion, than the hockey pucks and mason jars I’ve seen so far. The company hasn’t yet revealed a price or release date for the Galaxy Home. Read next: Which inexpensive IKEA stool does the Galaxy Home look like?